Excerpt of article originally published under the title "Erdoğan is Right: There is Something Shameful about the Refugee Crisis." [Turkish] President Recep Tayyip Erdoğan is right: there is something shameful about the refugee crisis. But he is wrong about whose shame it is. Erdoğan repeated his clichéd rhetoric at the G-20 Summit in China that "the West's attitude over the refugee problem is disgraceful." Once again, he accused the West of racism. ... Since the beginning of the Syrian refugee crisis, Mr. Erdoğan has claimed that it was (Christian) Europe's moral obligation to accept a big part of the refugees. Because the refugees want to go to (Christian) Europe? Why? We all know why. But why is it not the neighboring Muslim countries' moral obligation to host overwhelmingly Muslim refugees in their own Muslim lands? Decades later, Syrians fleeing the civil war in their homeland are not tempted into the same tragedy: They want to use Turkey and other Muslim countries as stepping stones to reach better, more civilized lands. Is it not neighboring Muslim countries' moral obligation to host Muslim refugees in their own lands? First of all, that is an Islamic self-insult: Why do Muslims risk their lives trying to cross into the predominantly Christian West, which probably most of them have viewed as "evil?" Why do our Muslim Syrian brothers not want to live with us? Why do they want to risk their lives and flee to Christian lands? Even totally irrelevant, faraway non-Muslim countries like Brazil, Chile and Venezuela have said that they would volunteer to take thousands of Syrian refugees. 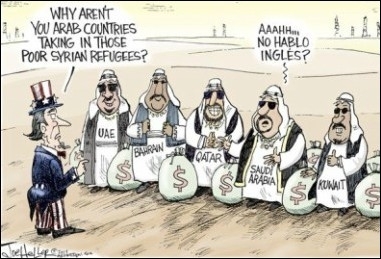 Any Muslim refugees in oil-rich Muslim Gulf countries? How many in the Saudi kingdom that is the custodian of Sunni Islam and is the seat of the holiest Muslim shrines in Mecca and Medina? And, even if they had invited Syrian refugees, would the poor souls prefer to be accepted by Christian lands or by the custodian of Sunni Islam? We all know the answer. The Muslim refugees cannot even stand Turkey, which is heaven compared to the custodian of Sunni Islam. And for all that self-humiliating picture, Mr. Erdoğan blames the West for having taken "only" over 250,000 refugees as opposed to almost none in the rich Gulf. Why really do Saudi Arabia, Qatar, the United Arab Emirates, Bahrain and Oman keep employing large numbers of Asian workers but have not taken even a few dozen Syrian Muslim refugees? Muslims in this part of the world view the Christian West both as 'evil' and as the most decent place to live. The moral story is about a grandiose, multi-faceted Middle Eastern dilemma: Muslims in this part of the world view the Christian West as "evil," yet they know quite well that Christian lands are the most decent places to live economically and politically, while wealthy Arab states are programmed to turn their back on the plight of fellow Muslims who are in need of a helping hand and Islamists blame it all on the West – the easiest thing they, too, are programmed to do reflexively. The legitimate questions here are: Why do "West-hating" Muslims want to go to the "evil" Christian West? Why do their fellow Muslim Arab nations not raise even a helping finger, let alone a hand? And why should non-Muslims pay for exclusively intra-Muslim wars and the wave of migrants these wars create?